Steve Stoute SCM – President – Barbados Olympic Association Inc.
One of the Caribbean’s longest serving Olympic officials, Steve Stoute was elected to the helm of the Barbados Olympic Association in 1996 after serving as Secretary General since 1968. His career in sports administration dates back to 1964, when he was appointed General Secretary of the Barbados National Federation for Cycling. Mr. Stoute was also a member of the National Sports Council of Barbados for a record twenty one years. 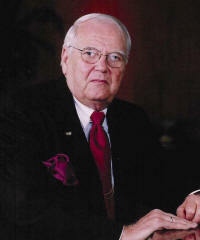 He served as Chairman of this organization from 1983 to 1994. He is the Chairman of the Caribbean Association of National Olympic Committees (CANOC) and Second Vice President of the Central American and Caribbean Sports Organization (CACSO). During his long tenure in sports administration, Steve has been presented with numerous awards but the two most significant were in 1991 and 1997. In 1991, on the occasion of Barbados’ 25th Anniversary of Independence, Steve was conferred with one of the country’s highest awards, the Silver Crown of Merit, recognizing over 30 years of service to sports and insurance. In May 1997 he was awarded the International Olympic Committee’s Olympic Order of Merit. On March 31, 2009 Mr. Steve R. Stoute, SCM, the President of this NOC, retired from Sagicor Life after serving 49 years at that institution. Mr. Stoute joined the then Barbados Mutual Life Assurance Society, BMLAS in 1960, as a “jack of all trades”, doing a little bit of everything including having to put on a jacket to deposit money at the bank! For quite a number of years he was the face of the Mutual especially in Barbados, and later with the international companies with which he conducted business and this happened as he steadily moved up the ranks of the corporation. In 1968 he was named senior underwriter. In 1972, he was appointed Underwriting Executive and Corporate Secretary. In 1989 he was made Senior Executive Vice President. He has also served as a Director on several subsidiary Boards and how he found the time to do all of these things we are really not sure. However, he was President of the Insurance Association of the Caribbean, and the Institute of Caribbean Home Office Underwriters; a member of the Canadian Institute of Underwriters and the Association of Home Office Underwriters; a Vice President of the Barbados Chamber of Commerce and Industry and is a regular speaker at regional and international meetings. He was also Vice Chairman of the first ever international underwriting conference held in Mexico City in 1997. Outside of Insurance related activities he was a member of the PAHO Working Party for Health Care Financing in the Eastern Caribbean, he served as Chairman of the National Sports Council, and sat on that Board for almost twenty years. He is the inaugural and current Chairman of the Caribbean Association of National Olympic Committees (CANOC). Mr. Stoute is the only person in the Eastern Caribbean to have been conferred with the Olympic Order, and as part of Barbados 25th Anniversary Celebrations, he was conferred with the National Honour of a Silver Crown of Merit for over thirty years service to sport and insurance. He was first elected to the BOA Board as Secretary General in 1968 and help that position till he was elected President in 1996, the position he still holds.